June 16, 2014 by Venky. A Race Like None Other!! 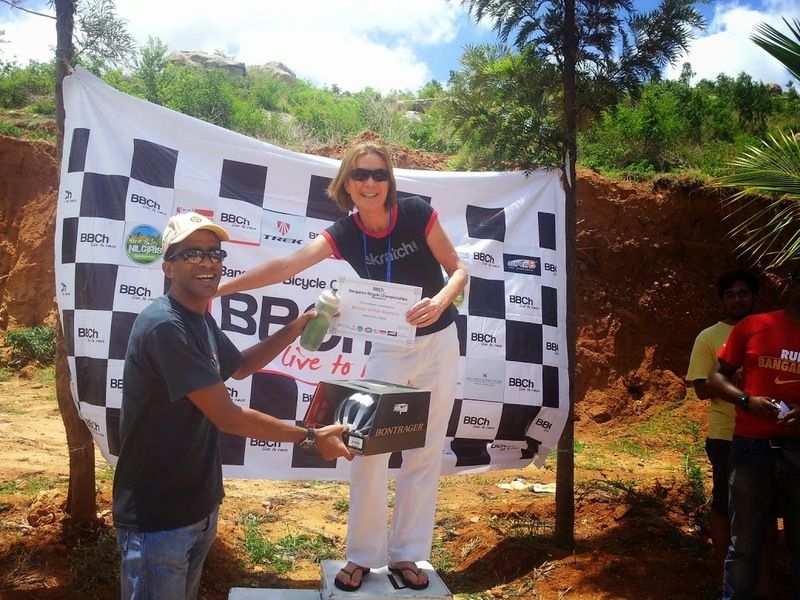 The Nandi Epic – BBCh 2014! When you saw 120 riders in their most colorful attire line up along with their bicycles on the Hyderabad highway and was wondering what all the fuss was about on a dull Sunday morning, you didn’t know anything about the most eagerly awaited race in the Bangalore Bicycle Championships calendar. 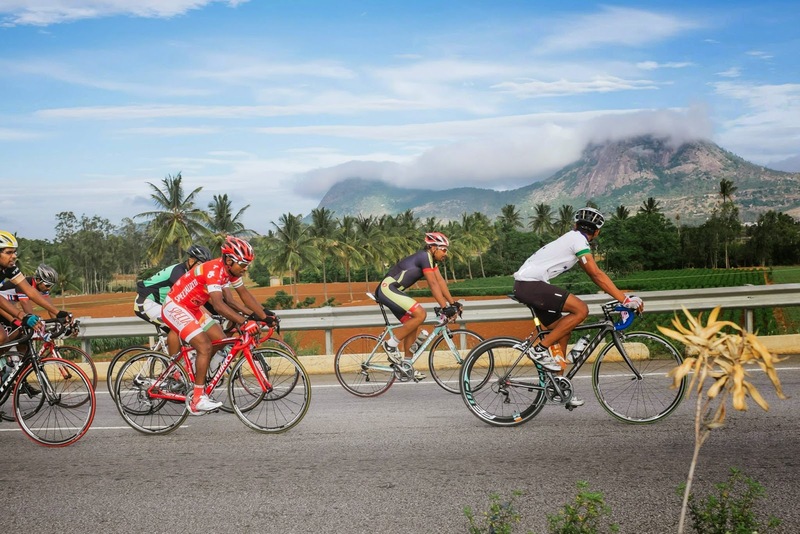 The prestigious Nandi Epic 100k race got kicked off at precisely 7am on Sunday, a few kilometers after the BIAL airport on the Hyd highway. About 120 riders in various categories and abilities lined up to battle the distance, the crazy winds on the route and the revered hill at the end of it all. Riders flew in from different parts of the country to be part of the race. Riders from Kerala, NCR, Chennai and Pune came in big numbers to challenge the Bangalore riders in their own backyard and see first hand what the famed Nandi climb is all about. 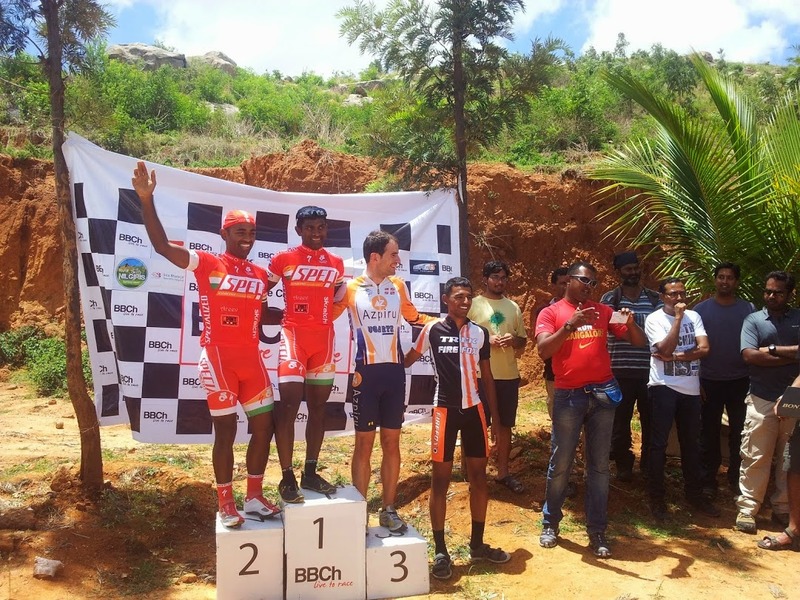 Specialized Kynkyny Racing Team(SKCT) and team Globeracers were the major representation from Bangalore while Team Trek Firefox Racing(TTFR) based in Chennai came in numbers from riders all around the country. 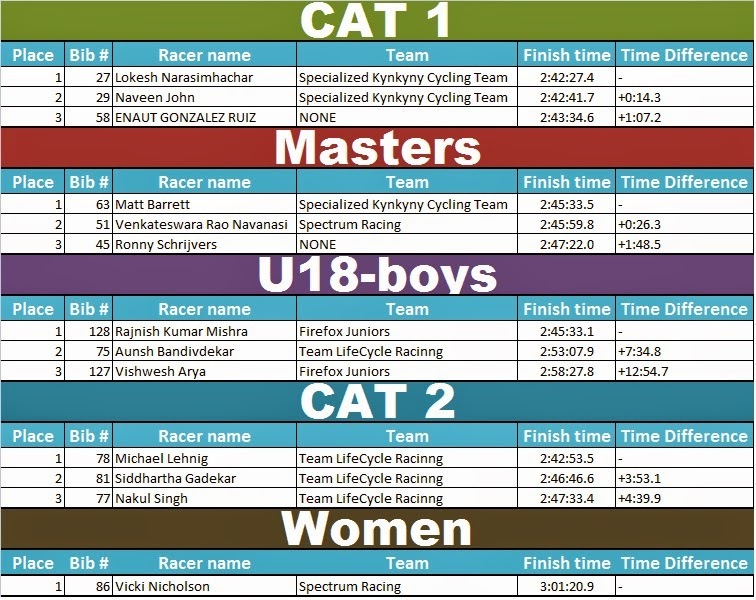 Team LifeCycle Racing(TLCR) from Pune had a huge representation in Cat2 although their riders were quite capable of giving the Cat1 riders a run for their money. Then there were U-18 riders mainly from TTFR and master’s contingent from Spectrum racing, SKCT and a few others along with three women riders. 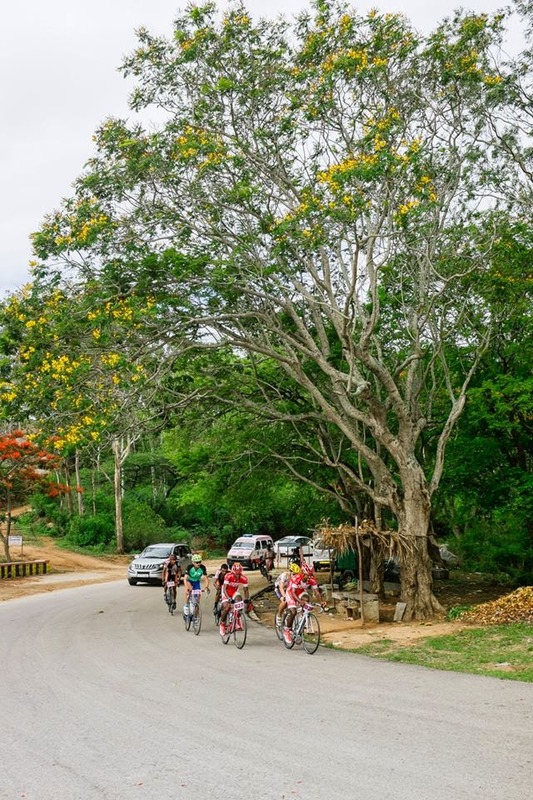 As the race kicked off, the huge peloton began moving north on Hyderabad highway at a brisk pace propelled by the cross winds(WSW) from behind. The early surges to thin the peloton down weren’t really successful thanks to the favorable wind conditions and the huge draft that everyone benefited from. As a result the peloton began to hog the highway blocking even the fast lane and thus inconveniencing the outbound traffic. To the behemoth buses and trucks always in a hurry to go somewhere, it doesn’t matter whether it is an overenthusiastic newbie or a seasoned pro rider marking his opposition moves early in the race, that come in their way. The danger of being run over is exactly the same and it all could turn very nasty. That is a reality of racing on open roads even with the requisite permissions. Multiple efforts by riders like Vivek Radhakrishnan(SKCT), Ankush Sharma(ProCycle) and a few volunteers on the bikes shouting at the top of their voice to instruct the riders to keep the fast lane free turned out to be futile. A couple of riders from SKCT(Specialized Kynkyny Racing Team) and Team Globeracers riding off into horizon early didn’t elicit any major response from the peloton. They were quietly reined in even before the U-turn. Even with the slightly favorable wind conditions, after the initial pace over 42kmph, the average settled to around 38kmph in the first hour of racing. Everyone was wary of the distance, the head/crosswinds on the return and obviously the 7.3km climb at the end. Around 37.5km into the race, there was a volunteer who was signaling the peloton to move to the right to avoid collision into the barricade on the left side of the road. There was U turn right after the barricade and this signal by the volunteer to move to the right was misconstrued by the peloton as the signal for U-turn. A few of us who memorized the pre-race brief that had the U-turn at 42km mark, immediately noticed the mistake but it was too late redirect the peloton and asking it to go 5km further down the road. I wasn’t going to complain that the 100km race is now going to be only 90km. It would be painful enough for me, whatever the distance. 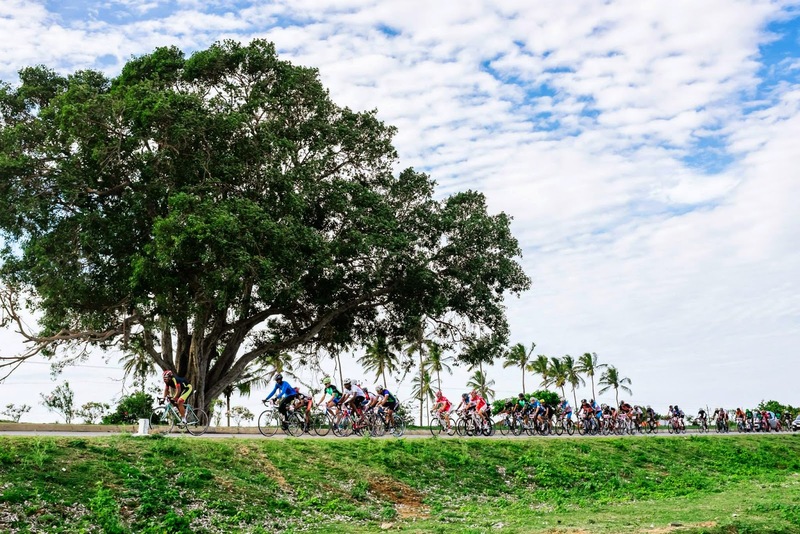 After the peloton redesigned its own race route and made the U-turn heading back towards Nandi turn-off(South), the winds(WSW) became crosswinds hitting the peloton from right to left from the front. Impromptu elongated echelons were forming to deal with the head/crosswinds. During one such formation one rider was rode into the gutter and ended up crashing into the barricades exactly 50km into the race. Luckily as it was on a slight uphill the pace was manageable enough that I narrowly escaped getting involved. By now, having ridden 10-15km after the U-turn, multiple attacks and counter attacks started coming from all the major players in Cat1. With one such attack, Loki(Lokesh Narasimhachar) and NJ(Naveen John) of SKCT broke away sparking a flurry of activity from TTFR and Globeracers. With its high possibility of turning into a winning break, the panicked reaction from the other major teams was quite understandable. Sarvesh Arya, the road captain and the main contender from TTFR was trying to marshal his troupes to organize a chase. Any halfhearted efforts by his men at the front were met by choice words from Jetaram(TTFR), and after a few futile efforts to stir their motivation, Jeta himself got to the front and got the chase going in full swing. A few riders from team Lifecycle racing, especially their main rider Michael were smartly sailing on this chase. The Basque rider, Enaut and I got on the train that momentarily got separated from the peloton to form a chase group. As the only master’s contender in the group, I was hoping that this group would go and catch the break and distance the other masters contenders that were left behind in the peloton and that I’d manage to ride to the base with a good time advantage. I knew that in such a scenario I could potentially burn myself out even before I got to the base, but if I manage to hang in there and still conserve, there was a chance. I was ready go broke with the prospect of a reward. It was quite mad trying to hang on to the wheels when the action got hectic and I deliberately refrained from looking at my garmin having scared myself momentarily looking at my HR numbers on it. It was time to go full gas and latch on to the wheels. I gave it all I had and managed to hang in there. But with more passengers bogies than engines there was a slight lull in the chase and the peloton that had the other masters contenders caught us back after a few kms shedding some riders from the back in the process. But by now the three tiny dots in the horizon, Loki and NJ along with Asif Attar of Globeracers who managed to bridge up to them, became clearly visible carrots and that reignited the motivation of TTFR riders. Another surge to chase materialized. I braced myself for another jumpy ride and was hanging in there. The continued efforts were showing their effects on TTFR riders and the carrots seemed to hang out in the front for a while. I was riding to the left most part of the road trying to sheild myself from the crosswinds when TTFR contender Sarvesh asked if I’d like to contribute to the chase. I could only nod earnestly in negative while trying to keep up. Although I was in no condition to do so, there was no way I was going to do any work at the front with no one in my category in the group ahead and burn myself out in the process. Trying to keep up with the young legs was contributing enough towards that end already. Eventually at 65km mark, 5km from the Nandi turn-off, the chase organized by TTFR finally reined in the break and everyone settled into an easy pace catching a breath. Arvind, Ronny and myself found ourselves at the front of this group as we slowly got off the highway and turned into the Nandi turn-off. The crosswinds became full on headwinds. Laxman Kurni(SKCT) whose only duty for the race seemed to be either attacking or covering attacks, rode off to the front. Despite my vociferous protests, my team Spectrum Racing skipper, Arvind Bhateja, decided to jump ahead and joined him in the break. By now we were around 15 of us in the peloton with TTFR and SKCT riders predominantly making up the group with 4 master’s contenders(Vivek, Matt Barret, Ronny and myself) along with Micheal of TLCR and Enaut. Everyone was watching each other. The pace became down right sedentary as SKCT was in no hurry to chase their own man and TTFR knew that the SKCT sprinter and Spectrum Racing skipper were not going to stay away to the line. Michael and Enaut also by then knew who their main rivals were and were just surfing wheels like they were doing all through the race. Ronny and myself found ourselves at the front of this group making snails progress. I was nervous seeing this as calm before the storm and was hoping they would pick up the pace to a steady tempo instead of going for all out attacks on each other blowing the old hearts like me in the process. I was trying to see if I can shoot mouth and make them pick up the pace but no one seemed ready to take any risks before they get to the climb. As NJ remarked, it looked like it was going to be a battle of weight to power ratio on the climb. After 10km of breakaway, our skipper, Arvind was seen tending to his cramps at the final turn 4km from base. His race was over but he had a great race till then, had fun and tried to be there for me when needed. No attacks came with the base approaching but everyone was keenly watching each other. Ronny was still dragging the bunch along at an easy pace and I was right there beside him as we hit the base first. 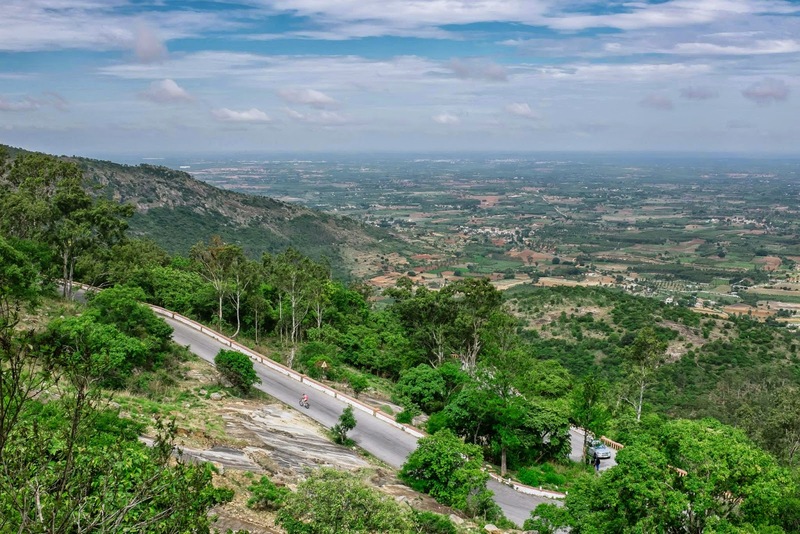 The click clicks of derailleurs adjusting were audible over the vociferous support of friends waiting for us at base as we stood up on the pedals and started our ascent of Nandi. The first curve is a kicker and it was enough to break up the bunch into smaller groups. Loki, NJ, Sarvesh, Mudit Sharma, Michael(TLCR) and Enaut pulled away from us along with a couple of other TTFR riders. Matt(SKCT), one of the main contenders for masters slowly got in front and I managed to get on his wheel. Siddhartha Gadekar of TLCR was with us and two of us were just trying to keep up with Matt’s brisk pace. The HR was in red but I was determined to stay with him as long as I can and see what I can do. I was happy to note that no other master’s contenders were with us. I later learned that Ronny decided to do a bottle change as the climb started and it resulted in a gap between him and us that he was never able to bridge. Vivek was apparently somewhere behind him battling cramps in his legs on his way up the hill. I didn’t see Ronny or Vivek on my occasional nervous looks behind and that was a bit of an assurance. I was just praying that the inkling of cramps that were showing up don’t siege my legs and that others wouldn’t catch up and pass me. I kept taking sips from my bottle and kept spinning as easy a gear that I can spin to keep up with Matt. The first 5k pace was almost 20kmph and this was the fastest I ever climbed up Nandi in the last couple of years. I was in red the whole time and when the gradient kicked up as we got near curve 30, my legs didn’t turn as smoothly as Matt’s were spinning and the inches of gap between his rear wheel and my front wheel grew to a feet, then meters until he quietly pulled away about 50 meters. He had the extra reserves of power which I couldn’t muster at that vital point and that was a telling moment in my race. I kept seeing Matt ahead but any effort to bridge was beyond me at the point. I decided to keep going and limit the damage by ensuring to keep spinning and not let the legs siege up there by losing ground to those behind me. My teammate Hari Menon was riding our support car behind me and kept my spirits up with his vociferous encouragement and urging me to keep spinning. His voice was a huge help in distracting me from the pain and I kept getting out of the saddle on the hairpin bends and kept spinning the rest of the way. Any last hopes of bridging up to Matt evaporated as I didn’t see him in the final bend as I turned curve 39. I just rolled into the Nandi arch with legs seizing up and heart ready to explode and the lap time on my Garmin showing 25:10 for the climb. 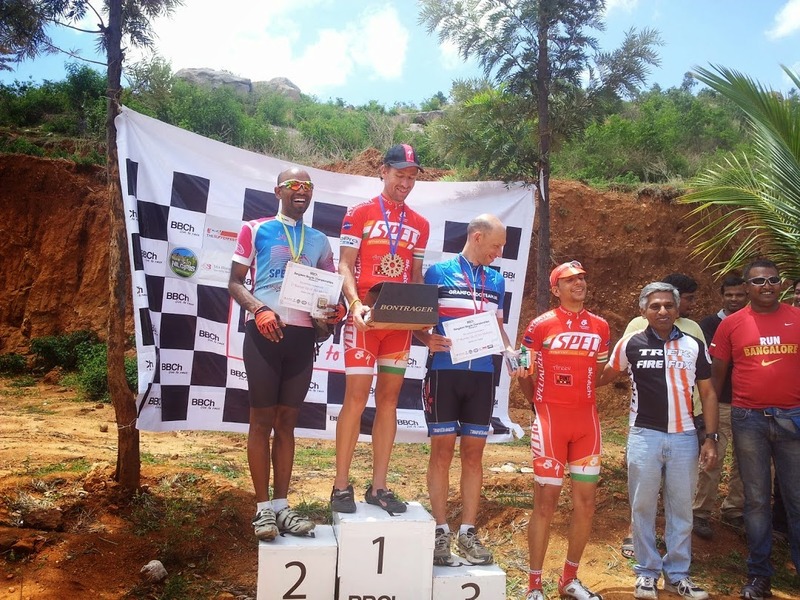 My best climb time in two years and just 30 secs off my best Nandi time ever. As I was suffering through my race, the riders up ahead were suffering and making their competition suffer in equal measures. The lead group of Loki(SKCT), NJ(SKCT), Sarvesh(TTFR), Mudit Sharma(TTFR), Micheal(TLCR) and Enaut were apparently together until halfway up the climb before the two TTFR riders cracked and got distanced. It was then a battle of attrition between the remaining four. When the pace kept being relentless, Enaut was next to crack and got distanced while Micheal from Pune kept on fighting the two local boys up their favorite hill. When the gradient kicked up further, Loki rode away from Michael and NJ and after ensuring Loki got a good gap, NJ got out of the saddle and rode away from Micheal to finish a few seconds behind his teammate. Epic Nandi Race Results across different categories! The Under-18 podium was dominated by the future generation of riders from Team Trek Firefox and Team LifeCycle Racing. It was great to see the younger guys riding in the group with discipline and showing great promise for the future. U-18 Podium! The future stars! In Women’s category, Spectrum Racing’s Vicki Nicholson again finished well ahead of the remaining two participants in the category as well as ahead of a lot of other riders across all categories. She continues to challenge herself and keeps getting better with each passing race. A constant on women’s podium, Vicki Nicholson of Spectrum Racing! In Master’s category, the old men didn’t do too shabby a job managing to stay with lead bunch till the base and finishing with in a couple of minutes of the top guys. Matt’s brilliant ride earned him the top spot on the podium while I and Ronny took the remaining steps on it. 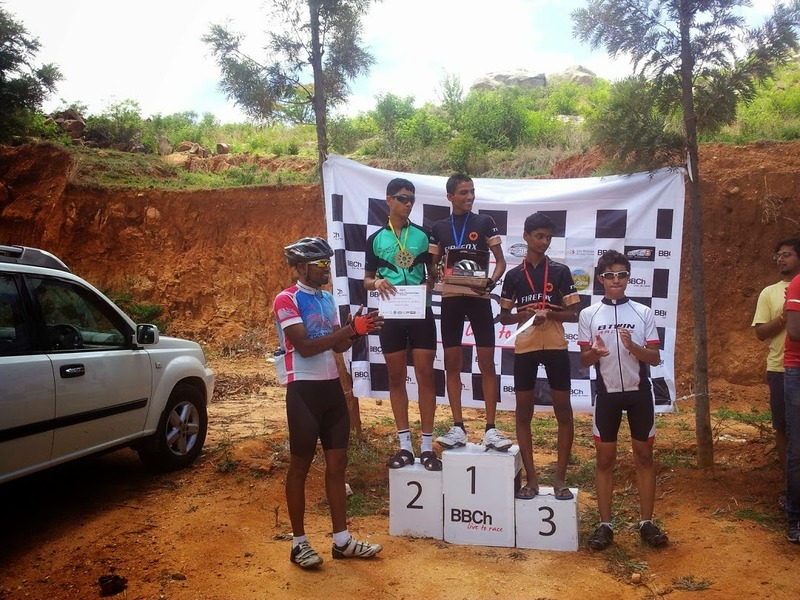 Cat2 podium was all Pune affair with riders from Team LifeCycle Racing. Michael Lehnig, in fact finished 3rd overall behind Loki and NJ. Great riding from him and his team. In Cat 1, our local star, the ever smiling Loki managed to show who is the boss when it comes to climbing. He won the prestigious race in style with great support from his team. NJ came in second while the brilliant Basque rider, Enaut finished third. Cat 1 Podium! Loki is back on the top step!! You can find the rest of the results here. PS1:Thanks to Chethil Mohan for the great photos. Please excuse the aspect ratio on the blog post. Some issue that I’m facing with the comp/blog that I’ve to resolve. In the meantime, you can click on them to view full screen and they’ll do justice to Che’s great talent behind the lens. PS2: Thanks to all the volunteers at BBCh that made the race a huge success and a great experience for all of us. There was confusion about U-turn and some riders who were way behind the peloton missed the U-turn and went ahead apparently as they did not find the volunteers there. Despite these minor glitches the race went very well. Perhaps we can take care of those minor issues as well. PS3: When I started training for this two months back, I was 6kgs heavier, dreaded climbing Nandi and was struggling to go sub-30. Any hopes of a good show in the Nandi race seemed a distant dream. But I wanted to at least do myself a favor and train to complete the race this time. The last two years I wasn’t able to complete the race because of ill timed illnesses and my own stupidity. Trying to lose weight, improve power and staying healthy at the same time is a very tricky proposition. I’m glad I managed to stay healthy during this period and that I finally broke the jinx by actually finishing my Nandi race in three years! Second place podium in masters, finishing a few secs behind an awesome rider like Matt, finishing ahead of awesome riders like Ronny, Vivek and many others, doing a 25:10 climb at the end of a 90k race after dealing with all the surges to stay with the lead bunch etc., are all bonuses I’ll gladly take! Thanks a bunch to my awesome team, Spectrum Racing, for all the support! Next A Windy Race On Winding Roads! 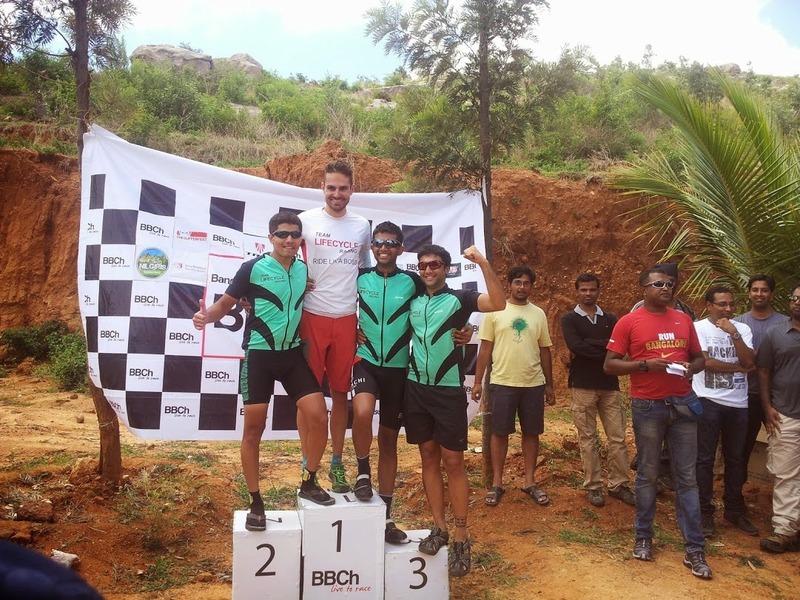 – The BBCh Gunjur Lake Circuit Race! Lord V, I kid you not, I almost raced on your bike in your place. Thanks a lot for the most lively debrief. Superb Venky, your writing is as good as your riding now. Was waiting for your write-up.. awesome as always..!! Sometimes I wonder, do we have Lord Venky's replica or something, one Venky rides and replica watching/capturing racing scene to write such awesome blogs?